Kent-born Londoner Natalie Evans's speaks to us about her beautiful and meticulously crafted stop-motion animated visuals for 'Lyre Song. 'Lyre Song' is the blissful yet yearning third song to be released from Natalie's debut album, 'Better At Night', which is out now via Small Pond recordings and contains 12 honeyed tracks composed of folk, pop, experimental and classical influences. Why did you chose to create stop-motion visuals for 'Lyre Song’? I’ve been trying to do more visually creative things lately and I wanted a video that was a bit different to what I usually do. I thought it would be a good challenge and that I would learn a lot through making it. I also found myself living in an empty house for a week so I had the space to create mess and to become completely engrossed in something without distraction. The video basically tells the story of the song using cardboard cut outs. Overall it’s about someone who doesn’t know what to do with their life and is feeling a lack of adventure, then their best friend leaves for another place and is having loads of amazing experiences and it sort of intensifies all of these insecurities. The person who has moved away goes kind of ‘off the grid’ and the other is left still at home on their computer. In the song there are a few references to people keeping in touch via computers so there is a typing scene throughout which the video keeps coming back to. 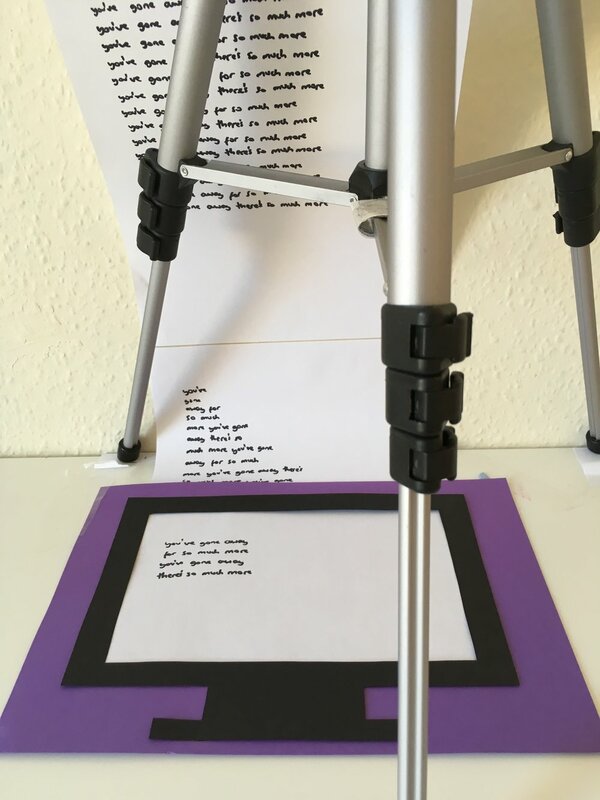 So I made the video using my iPhone and balancing it on a tripod, it was all very low budget. I ran into quite a few difficulties along the way and probably made it unnecessarily difficult for myself at times because I was learning as I went along. I had to be very careful not to move the tripod or my phone during scenes and there were a few which I had to redo because of accidentally nudging something, or because there was a mark on the cardboard or some blue tack showing etc. 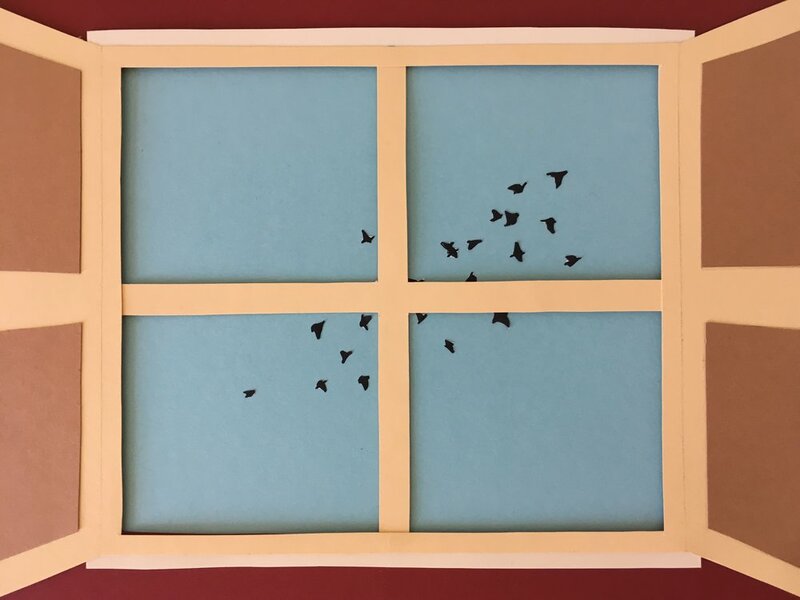 The birds were initially sort of floating across but I decided I wanted their wings to flap and it was really fiddly, particularly with moving them behind the window frame. I did it by swapping in and out birds that were in different positions. I was really happy with how they turned out in the end. cardboard and paper so I had to pick loads of blue tack out of the carpet after, so that was fun haha. I barely tidied the floor throughout the whole process so it was a total mess which I felt quite proud of. Tell us about the ideas/ themes/ imagery used? The video begins with the person opening their window in the morning and ends with them closing their window at night. The morning/daytime window has birds and kites and at night the sky turns black and the moon appears. The moon rotates to show all of the different phases, implying the person has been in the same bedroom and living the same life for a long time. I’ve been learning to cartoon lately so I wanted to play around with speech and thought bubbles in the video. At the beginning both of the people speak and think in the same colours (blue, pink and purple), but towards the end one person is still stuck in those colours while other who has ‘gone away’ is now thinking in different colours. It implies one has moved on and the other hasn’t. It shows that they have become distant. They are also no longer speaking but only thinking in their own worlds/lifestyles. Towards the end the person scrolls through all of the words they have written and it shows how they’ve repeated the words ‘you’ve gone away for so much more, you’ve gone away, there’s so much more’ over and over again like I sing in the song. I wanted to show that the person can’t take their mind off the confused feelings of not knowing what they should be doing with their life, missing their friend who they are also envious of, and feeling stressed about needing to make the most of being young. I think the experiences and feelings conveyed in the song and video are quite common these days with the internet and the ability to travel (so much choice! ), so I’m hoping it will bring people some comfort if they can relate to the thought processes I was going through when I wrote the song.